Later that night, he hears his baby brother crying, so he gets up to check on him. He finds that the baby has severely soiled his diaper. So the little boy goes to his parent’s room and finds his mother asleep. Not wanting to wake her, he goes to the nanny’s room. Finding the door locked, he peeks in the keyhole and sees his father in bed with the nanny. He gives up and goes back to bed. O’Jays front man Eddie Levert has lost another son. Sean Levert, one third of the popular musical trio Levert, died of unknown causes after beginning a one-year, ten-month jail sentence for failure to pay child support. There is currently no suspicion of foul play in this death... but the coroner’s investigation concerning the nature of Sean’s death has not yet been revealed. Our prayers go out to the Levert family and loved ones. I was scratching my melon over the story published in The Boston Globe about a woman who got kicked off of an airliner for the crime of breastfeeding her child. Granted, the post 9/11 rules say you can’t bring liquids on a flight... so if a mother can’t bring milk or formula, then breast feeding is the only alternative. Naomi Watts had better luck when she breastfed her seven-month-old son during a 14-hour flight. Maybe it helps to be a celebrity traveling in first class to be permitted to breastfeed your child on an airline? I remember, as a wee youngster, watching Huckleberry Hound cartoons on some esoteric UHF station... long before the advent of cable and satellite TV with billions and billions of channels (as Carl Sagan might have said). One favorite was Tough Little Termite, where a tiny bug caused what would be millions of dollars of damage in real life. While termites can eat away at the foundation of your home, can you or your children suffer from a termite bite? Fortunately, termites are no danger to animals or people. What they do best is destroy your most valuable investment -- your home! Are you and your family safe? Maybe you had better check it out... before it is too late! So, how does a Presidential Candidate such as Senator Barack Obama connect with the blue collar working Joes in the Commonwealth of Pennsylvania? Well, one good way to start is with a pair of size 13½ bowling shoes. Hmm... so what is it they say... big feet... big tax breaks? Anyway, the Obama family tree continues to get more and more interesting’er. 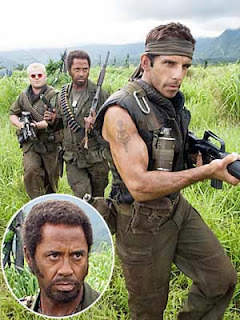 According to TMZ Obama is related to Brad Pitt. Hillary Clinton is related to Angelina Jolie! Now, this gives us some interesting ideas. Let’s just stop with all the debates and pundits and caucuses and just work this thing out Mr. and Mrs. Smith style. You may not remember the 1984 motion picture about the horrors of genocide in Southeast Asia, “The Killing Fields.” But those who grew up during or shortly after the Vietnam war remember the horrors that the people in Cambodia suffered at the hands of the Khmer Rouge, the Communist Party of Cambodia. 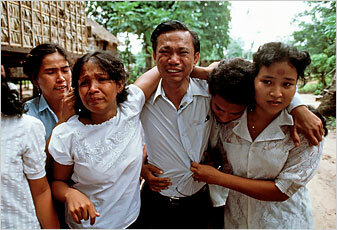 The man who opened the eyes of the world to these horrors, Dith Pran, was a photojournalist who worked for The New York Times. Pran’s photographic work inspired the motion picture, which garnered an Academy Award for actor Dr. Haing S. Ngor. The 65 year old Pran, a resident of Woodbridge, New Jersey, will be remembered for many years. No, not Britney... it was Hillary. 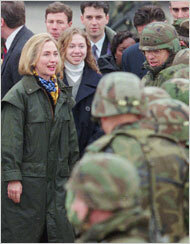 First, she stated (on at least two occasions) of ducking and dodging sniper fire on a fateful trip. This was ostensibly proof of her foreign policy experience. Then, video of that trip came out and (surprise, surprise) there was no sniper fire... and, in fact, what we saw on the video directly contradicted what came out of Hillary’s mouth. Hillary recanted, stating that she misspoke and that she is only human. Later, Hillary decided to badmouth Barack Obama because of his former pastor. You think she just misspoke again? One of the reasons I don’t have satellite radio is because I couldn’t choose between XM and Sirius. 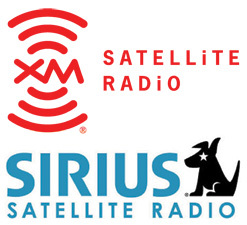 But now, the Justice Department has given permission for XM and Sirius to merge. That is great news. The question... how long to wait to decide which receiver to buy? There is, of course, the other question. How will Martha Stewart and Oprah Winfrey feel about being on the same network as Howard Stern? You may have read the New York Times article that gives the death count for the Iraq War as reaching 4,000. 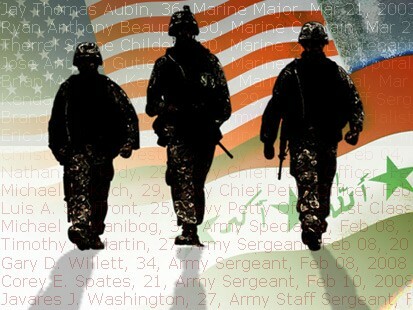 This not only includes young men but, for the first time in our history, young women who have died in combat. Pray daily for our young men and women who are serving in the Persian Gulf. One of the side effects of an economy in recession is people unable to keep up with their debts... resulting in bad credit. The problem is, when time comes to get a new car, or a house, or even furniture for your home... your credit rating can determine whether you drive or walk. Whether you own or rent. Whether you sit on a new leather sofa or on a milk crate (or, on the floor)! If your credit is messed up... either because of the state of the economy, or because of bad decisions that you may have made, you need something to help repair and restore your standing. That is where bad credit credit cards come in. You can use this site to compare the top ten credit cards for bad credit and apply on-line. Use your new card wisely and you will find yourself on the way to rebuilding your credit and, perhaps, your financial future. Remember that song “River Stay Away From My Door” by Frank Sinatra? Click here to listen to a clip. Well, the folks in Missouri can probably relate. 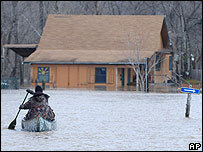 They have been experiencing floods like crazy. According to The Chicago Tribune, five people have died... and there has been extensive property damage. The death toll nationwide from these freak floods is at least 13, according to the BBC. 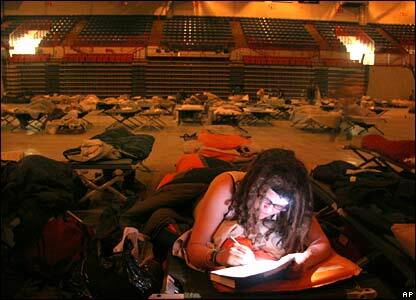 Dozens of people have been evacuated from their homes and are sleeping on the floor of a stadium. 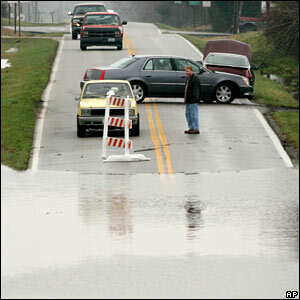 With roads closed and even houses being washed downstream, it looks to be another heartbreaking disaster. Estimates are that FEMA will show up some time before 2011. Former Presidential candidate and New Mexico Governor Bill Richardson is endorsing Senator Barack Obama for president, The Associated Press has reported. “I believe he is the kind of once-in-a-lifetime leader that can bring our nation together and restore America’s moral leadership in the world,” Richardson said in a statement obtained by The Associated Press. Battling the bulge? click here for slimming shapewear! We were surprised to see on IMDB that the acclaimed science fiction writer Sir Arthur C. Clarke has left the planet at the age of 90. Most known for the classic 2001: A Space Odyssey, Clarke sat beside CBS anchor Walter Cronkite during the Apollo moon shots in the late 1960’s and was knighted in 2000. Although briefly married in the 1950’s, Clarke died with no heirs... only millions of fans who have enjoyed his work. The New Orleans Public Library is asking for any and all hardcover and paperback books for people of all ages in an effort to restock the shelves post-Katrina. The staff will assess which titles will be designated for its collections. The remainder will be distributed to needy families or sold for library fund raising. Be sure to send them Library Rate to save money on postage! The 5th anniversary of the invasion of Iraq and, according to The New York Times, the initial cost estimates to fight this war were a tad off. Originally, it was thought that it would cost between $50-60 billion to remove Saddam Hussein from power and create a new democratic government. And now, five years later, American taxpayers have spent roughly $600 billiion dollars. That works out to about ten times the original guesstimate. You can view an interactive timeline of the Iraqi war in the NYT Middle East section. Hopefully, we will once and for all be over the race issue and get back to the real topics of mudslinging that we are used to on an election year. But seriously, folks... the speech that Barack Obama delivered today should answer, once and for all, the issues about his former pastor and about the future of race relations in the United States. You can read the full transcript of the speech and make your own determination. According to Variety, Minghella succombed following a surgical procedure. Prayers for his family and loved ones... and to all of the fans who will miss him and his creative work. Life is short! Make sure you have made your travel arrangements! After watching Steve Carrell attempt to channel Paul Lynde in the disastrous movie version of Sol Sak’s classic comedy, Bewitched, I thought... what next? Would you believe that Steve will now be doing the character created by Mel Brooks and Buck Henry... and embodied by Don Adams? Both the Globe and the National Enquirer have posted the most ridiculous accusations against the front runner in the Democratic race. Now, we don°t want to make any accusations as to who would allege that Obama has terrorist ties or that he has been on the D.L., but we hope people will see through these thinly veiled attacks. Samantha Power, a professor at the Ivy League Harvard University (a place where Dwacon® briefly matriculated), made the comment to a European newspaper and later apologized for the remark. But was that all she had to say? As Marissa Tomei said in “My Cousin Vinny,” THEY’RES MOWAH! Ms. Power also told The BBC that she had doubts about Obama’s plans to withdraw troops from Iraq.